There you are, going about your normal day and feeling pretty healthy overall, with no pressing “health concerns” or issues, and then you feel a twinge in your back. And immediately you know something has gone seriously wrong. At first, you try to just brush it off, thinking that you’ve had twinges of pain and that they’ve usually gone away on their own. But this time it’s different. The good night’s sleep that you thought would cure your back pain didn’t do the trick, and in fact your pain seems to have gotten worse overnight. Here’s an important concept you need to grasp (and quickly): when lower back pain strikes, if you don’t treat it quickly, it can leave you suffering for a lot longer than necessary. It all started one day when she was rushing to finish off a load of laundry one evening. When she bent down to pick up the basket, she experienced a sharp pain in her back that left her hunched over. Like most of us, she figured a couple days of “taking it easy” would do the trick, and she’d be back to normal in no time. Unfortunately, her couple days of rest turned into several weeks. Not only that, but all of the sitting and resting was actually making her back pain worse, and her pain gradually started to shoot down the back of her left buttocks and into her leg. In Michele’s case, her lower back pain and sciatica have been caused by a bulging disc in her spine. Her bulging disc is now putting some pressure on her sciatic nerve, causing pain as well as some numbness and tingling in her leg. So what did Michele do wrong? And what can she do to cure her back and sciatic pain? You may have already picked up on this, but Michele’s biggest mistake is that she tried to ignore her pain and thought that resting would make it better. Many people compound this mistake by taking painkillers, which only mask the pain, and they often make themselves worse in the process. You may be asking yourself this question: “Why doesn’t resting help?” It seems like it should right? In this case, Michele’s resting was primarily sitting down. And while sitting can feel good for brief periods when you have a bulging disc, it’s actually putting a ton of pressure on the disc. If you’ve ever had a bulging disc, you’ve probably experienced this… It feels good to sit, but then when you try to stand up…ouch, even worse than before! Okay, so we know what Michele did wrong. What can she do to start experiencing pain relief? Start to slowly stretch your spine backwards. Try standing with your hands on your hips, then slowly try to bend back and hold for 10 seconds. This may be a bit uncomfortable at first, but ease your way into it. If you can follow these 3 tips, you’ve got a good shot at starting to reduce your disc bulge and removing the pressure from your sciatic nerve. 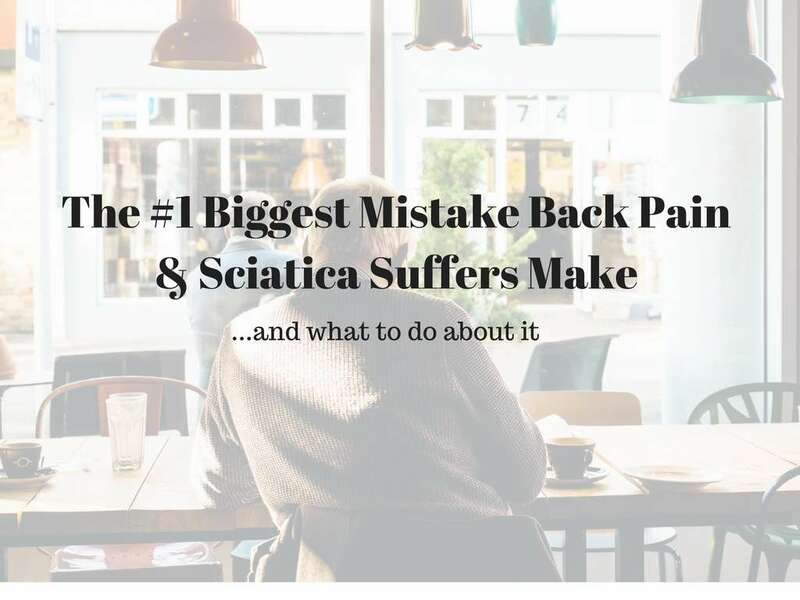 One word of caution before you start: these tips and principles work extremely well when you’re treating sciatica pain caused by a bulging disc. If you’re not sure what’s causing your lower back pain and sciatica, and you’d like to figure it out before you try to treat your own pain, please read the announcement below. If you’d like more information about how to recover from Back Pain and Sciatica, I’ve created an educational workshop at the clinic. Our “Low Back Pain & Sciatica” workshop is completely FREE for all of our past patients, friends and family. To secure your seat at our next workshop, call our office at 509.892.5442. Stephanie or Serena will give you the details about our next workshop when you call.